1-1-2-3-4-3 or bust. Any other profile and I'm out. Do the right thing and I'm in for a Quarry, Hagoromo, and Monochrome kit. If this set had an option for 2 space-bar row blanks, I'd be in love. looks great, love the git kit. Text on the ergodox Please!! with that im IN! You are in luck, I was planning to do that as it's very boring indeed but wasn't sure how. If the set ends up being sculpted, regular legends aren't good with all the different layouts people use and they'd be unable to move the keys much due to fixed profile. I wanted to do the Assembly kit as the second Novelty kit, but that would only really make sense with the 3-3-3-3-3-3 setup as it could be used in all sort of places. Function row, Planck, Ergodox you name it. If the decision lands on sculpted, it will probably be exclusive to Ergodox. Not sure if people are okay with it being the default lettering of Ergodox, so that's something else I need to find out. If not, maybe blank keys would be included as well. Instructions used are not final, I just threw some together from a list of the most frequently used ones in ASM. I don't code ASM so I will talk with a buddy on the weekend to figure out what makes the most sense, if they even can have actual meanings here. And I couldn't resist to throw in HCF, god I love that show. the set is missing a SHIFT 1.75 fo 96 layout users. Please modify! Agreed. I love this set and would love it even more if it had a 1.75u shift and/or relevant modifier or novelty key. I'm more excited about this IC than any others. Any chance of a Tsagan/HHKB Kit and or a ISO/Nordic kit? Also why is there no FN keys? Me too. Monochrome/greyscale + colorized legends on modifiers is the ideal, even moreso than Penumbra to me. I look forward to this set reaching me in a year or three. correct - we need that option! Support for 1800 lauyout please. Concur. If it's uniform R3, I'm out. He knows, just give it some time. I find the use of a non-existing x86-64 assembly instruction rather boorish. Especially considering that the less than mediocre television show it pays a tribute to, is completely irrelevant to this project. I'll accept my 2-2-3-3-3-3 proposal defeated with such a low vote count for it, but wasn't too attached to it anyways. Sculpted is fine for me too. To everybody who will now have to jump ship, I am very sorry. I hope you will get to enjoy this set some day with a DSA or GMK run. - CODE has been changed to META in Oblivion and Monochrome kits, CODE didn't seem to make much sense really among regular legends. - STATUS has been added to the Git kit, which I consider final now. - Quarry and Hagoromo colored 2u thumb keys have been added to Ergodox for more flavour. - Regular legends on Ergodox and Planck are now a no-go since people use different layouts where the legends often don't fit but can't be moved to their appropriate position due to sculpting. So I have decided to use Assembly instructions here which are neutral to the functional purpose of the keys and add the set's signature colors to these keyboards. I hope you enjoy them as much as I do! - Up/Arrow Up has been duplicated in the Oblivion and Colored arrows kits to support both 2-3 and 4-3 arrow layouts. Without further ado, here are the new previews for the currently probably-finished kits. Bigger images for the individual kits have been updated on the first post again, the kit combination examples there will be out of date for a couple of days or so now, but still reflect the overall impression of colors. I will now mainly be working on specialties kits such as Tsangan&Whitefox, ISO UK, WKL, Dvorak&Colemack and International (Danish, Finnish, German, Norwegian, Spanish, and Swedish, identical to Chocolatier). The latter two I will have to limit to Quarry colors, sorry. CALL keys have been added as alternatives to the joke-instruction that some systems actually have. The plank kit is too simplified and please add more keys. The average price for this kit is around $20 with couple of layouts support, if the price is what you have concerns here. The Planck kit from Pulse does exactly what I'm trying to avoid, add many many keys to hopefully cover everyones layout. While I have opted for different legends that don't actually reflect the key's purpose so you can bind whatever you want to them, it will always make equal sense. Chocolatier and Jukebox cover more than just Planck, it would become a 40% set, in which case Assembly legends aren't appropriate anymore. Something else I'd like to mention, the Colored Arrows kit doesn't actually make much sense as it would be quite expensive for what you actually get out of it. 25 keys out of which only 4 would be used on average, which is very poor. So I wouldn't get too attached to that kit. Monochrome I hope will stay, but would probably be the next in line to be dropped should there be the need to cut off more, but thats a big if. You have the point here, but I still believe the extra R3 enter and R4 shift is needed for people use such layouts. For arrow kit, how about just one arrow pack with four different color legends? This! My Planck layout has deviated so far from the original layout, that practically no keyset will actually serve my purpose, except for Granite. I wish keyset designer will start to use blanks like they usually do with Ergodox. I know I'm not alone, looking at qmk firmware repository, maybe over half of the committed keymaps don't use the standard bottom row. I like your idea of using abstract labels instead of blanks. Boards: Filco TKL+HID Liberation, Infinity 60%, Sentraq S60-X, Whitefox, Ergodox, Planck. Member of the flat keyboard society. 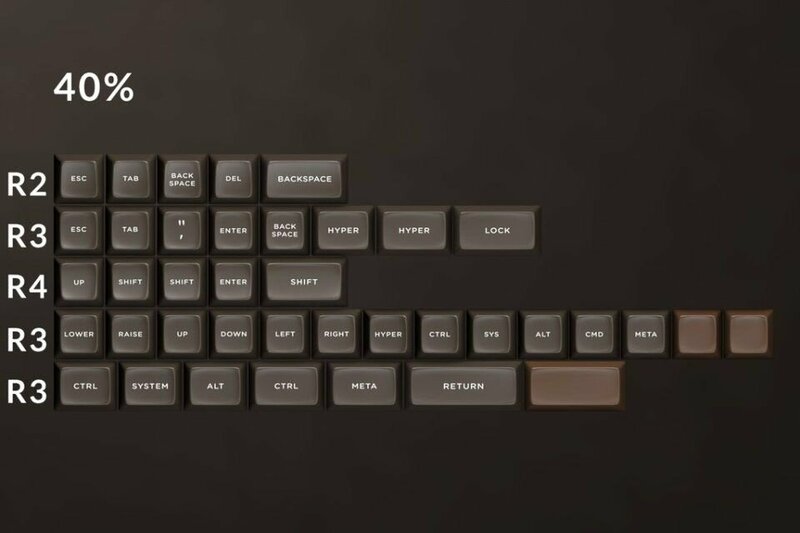 Keycap manifesto: "Key sets without vendor neutral Super key are worthless"
Love the idea of this set. Should the Oblivion set have a 1.75 R4 Shift for most 60% keyboards? This will be included since he is working with the adapter kit, no worries. 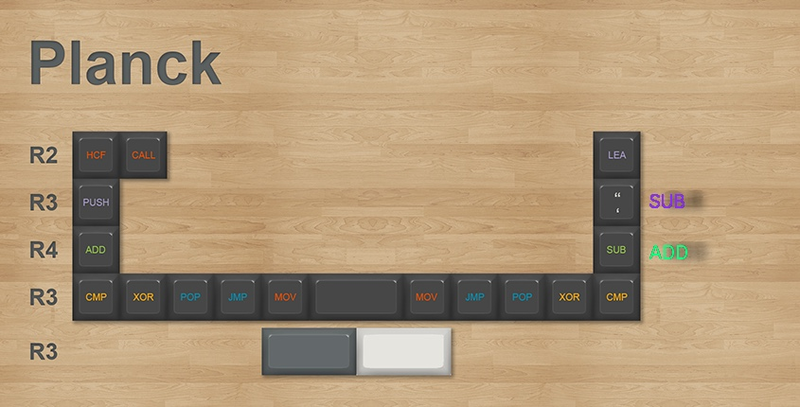 EDIT: I'm looking at the dox kit and apparently you use R3 on the last row after alphas (many if not all previous dox kit always use R4), if you go this way and adding a couple of R4 with legend then you can built a Planck Kit out of the dox! Oh and btw the 2u blanks on dox kit...isn't it a bit too much? I don't think you need 2 pairs of every base color for it. i don't really understand why ctrl, alt, and menu are the same color, but win/meta is a different color. it seems to make win/meta out to be special somehow? also, shouldn't it be super rather than meta? other than that, will strongly consider getting me one of these if it comes with one of the fully sculpted layouts. i don't think i need another flat SA set. So with the git and monochrome it would have 2x 2.75? Any chance of some extra keys in the Planck set to cope with the full Grid layout (2u space only works on MIT layouts). Godspeed solved this with a 2u blank, and 2x 1u blanks. As this set has thematic legends, 1x 2u blank, 2x 1u blank, and 2x 1u legend (in some other color perhaps?) would work. Specialties kits are coming along nicely. With the help of our resident van driver evangs (there was no candy in the back, only chocolate) I have come up with what I like to call the Assembly kit in spirit of these very down-to-the-core keyboards, just like the programming language itself. It covers, to my very limited knowledge in this area, MiniVan/JD40/JD45/Minorca/Sebright/AMJ40/Golbat/Planck/Preonic and Atomic. Please correct me if there are any errors here. Since some 40% boards use 6.25u spacebars, and Tsangan use 7u spacebars, I have created spacebar kits for each size which contain all three colorways each. Whitefox users take their 6.25u spacebars from the alphas kits. I hereby consider specialties covered, so if something is off, please say so. Even if you have mentioned it before already, I am currently assuming that these kits are completed, so repost what you wrote. CapsLock and Ctrl keys in the Tsangan&Whitefox kit are stepped, I need to create the appropriately shaded overlay for that still. - I'm considering splitting Oblivion into Mods and TKL sets as 60% and below users don't need the TKL stuff, and anyone wanting to go for Git or Monochrome wouldn't need the Oblivion mods. - Figure out how to run this GB successfully enough to meet MOQ on these bazillion kits. Oh and Colored Arrows kit has been kicked off the ship due to the poor ratio of keys used in that kit. Didn't like the asymmetric look of 4 arrows having one color each either. First post will be updated accordingly tonight or so. Looking great, very happy to see 40% support! Will definitely be buying this. 2u Enter and 2u Shift would be all that's needed to support Atomic in the Planck/OLKB kit if you were so inclined. I saw some minor differences in the Tsafox kits of Chocolatier and Godspeed which I mainly used as a reference, Godspeed had 2 more keys in R3 while Chocolatier had 2 more 1u keys. The ones Godspeed had additionally might be the ones you are looking for. alright so base + assembly + git will give me 2x 2.75 that don't say "shift" right? Enter and Shift for Atomic is R3 and R4. Honestly I prefer you separate the ortholinear kit and staggered 40% cuz I believe even when separated they will still hit the MOQ while lowering both price. Godspeed PhD and 40% kit is good example for these kind of kits. The theme and colors of this set are great. Very interested in this. - Check the Godspeed drop on Massdrop, the kits are very well designed. Norde-Kit with ISO keys is great. Planck (Ortholienear), 40s (Split space bar!) and Tsafox kits are first grade kits. Toying with the Kit names as well, I find them fitting but they might be too confusing in the actual GB run. The reason to offer spacebar child kits is so that customers can buy extra spacebars. These are ABS after all, and having replacements is desired by many. However, in this case it isn't terribly necessary since SP sells individual spacebars in both GD and WFK from their webstore. I see, thanks for the clarification. I'll leave it out for now as it's not essential, but I'll keep it in mind. What board are you trying to cover? New overview of Kits, International and UK coming very soon, no worries. Once those are done, and no changes need to be done to any of the three specialties kits, I guess that's it? Big images for individual kits in the first post updated. Edit: Oh yeah, I'm not sure if Ergodox people want R3 or R4 below the alphas http://www.strawpoll.me/11458621 another Strawpoll I guess. I'm just now realizing how much money this set is going to cost me. Edit: Also undecided if Planck/40's spacebar's should be alpha colors or modifier color only. Think a short spacebar looks better when unified with the rest of the mods. Time to sleep about that! Only other addition for me would be a 1.25u row 2 tab for JD45 / JD40 keyboards. I haven't seen any sculptured sets with one of those yet, so maybe it would be worth considering looking at typical JD40/45 layouts. Either way I will definitely be in this when it goes up for sale. I guess there's no chance of a Colemak/Dvorak set for the White Alphas? Unlikely, even very successfull GB's on MD such as Chocolatier or Godspeed had rather low numbers as it is, chopping those numbers in half on top of that... . The UK kit will have both since thats just a couple alphas, but Dvorak/Colemak and International are probably going to be Quarry only. Good and bad news. I've decided to go back to the dark modifier color for the spacebars, it doesn't look as good having such a tiny break of the color of the bottom row with spacebars that small. Bad news, the 2.75u keys from the regular Modifier packs are Row4 profile, and you need 2x Row3. Do you know of any other boards that have 2x2.75u in the bottom row to warrant the addition of a secondary one to the kit? Since I'm kicking off half the spacebars with the change back to the dark color I can add a few keys, such as the 3u for Filco Minila as requested earlier. Essentially what I need are extra 2.75u's - as long as they don't say SHIFT on it its all okay - additional modifiers could be blank or maybe you pack a 2.75u in another mod pack...?